From Goodreads ~ In today's busy households, chicken has become a standard meal for people who want good and healthy food in a hurry. 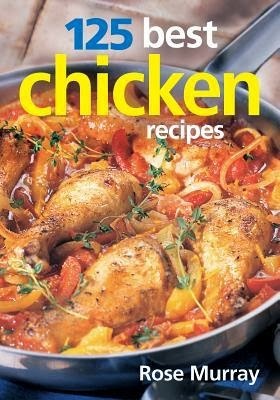 With "125 Best Chicken Recipes," there are dozens of different ways to prepare delicious and inspired chicken dishes - all in record time. Whether using a skillet, frying pan, oven or grill, most of these recipes can be prepared in 20 to 30 minutes. With just a few ingredients, chicken happily takes up flavors from all parts of the globe, whether it's Coq au Vin from Europe or the savory curry flavors of Easy Tandoori from India. I like chicken and we eat a lot of it. But I rarely do anything exciting with it ... sprinkle on some premixed spices or Shake 'n Bake it. So that's why this book caught my eye. The recipes seems easy and quick and you don't need fancy ingredients. The book starts with a quick chicken pantry ... ingredients to have on had to make the recipes. Then there are some instructions on buying and cooking chicken. I know that chicken is low in calories but it would be nice to know the nutritional information of the recipes. I definitely like to know the nutrition in a dish, too!